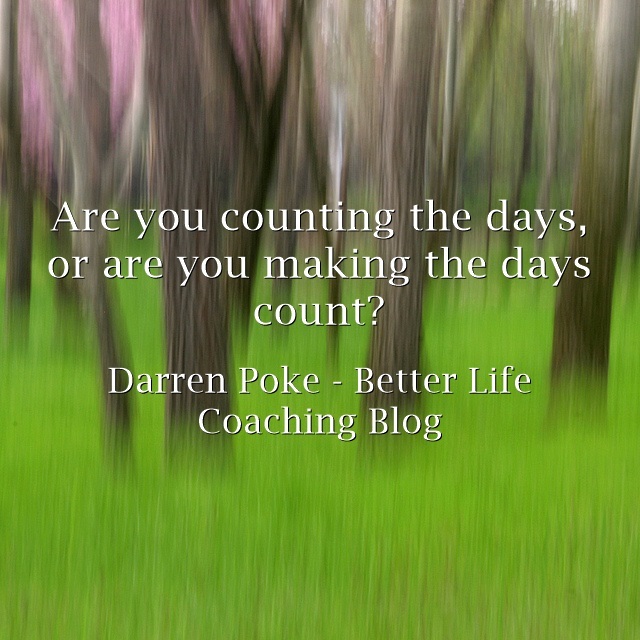 Are You Counting the Days, Or Making the Days Count? Are you waiting for the weekend, or are you doing something meaningful with your work during the week? Are you waiting for someone to notice you, or are you working hard to ensure that they can’t miss the quality of your work? Are you waiting for the perfect circumstances, or are you doing all that you can to make your circumstances better? Are you waiting for your kids to grow older, or are you enjoying every moment that you have with them now? Because here’s the issue. Most people meander through life watching the clock and waiting for it all to end. They think that the pinnacle of life is retirement, when they won’t have to work anymore, rather than understanding that the pinnacle can be the work that they are doing and the contribution that they are making right here, right now. And so the days drag into weeks, months and years as they float along with the tide, wondering if it will ever get better and hoping that it will. I want to encourage you to stop waiting and start acting. Don’t make the mistake of counting the days, but make every single day count. Maximise your life, increase your impact and be the person you were born to be.